A disastrous week for most this week! 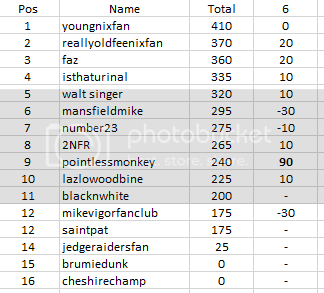 Well done to pointlessmonkey for outscoring everyone else...combined! As usual, take the initial results with a pinch of salt as i'll doubtless have made a typo somewhere. If they survive the weekend then you can take them as accurate. Yeah, missed the big capital letters. D’oh!